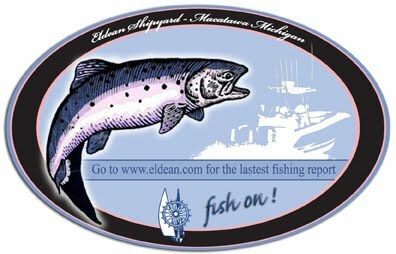 Lake Michigan Fishing Report: Fishing Fireworks on the 4th! night at 5:15pm starting in 150 FOW, N42’ 43.5’’ trolling south. Started with 12 lb lake trout on a NBK 80’ down. Picked up 3 kings in the 8-10lb range: Killer Dolphin on SWR 68’ down, mag Blue Lagoon 92’ down, spinny with blue mystic fly on a 1-set dispey with ring 160’ back. After cutting through a 3-line tangle and getting the gear back in order, pick up three more kings of about the same size in about 140-150 FOW, two on the Killer Dolphin SWR 68’ down and one on a purple stinger on a 1-set dispey with ring 130’ back. All fish came on either a south or east troll. Could not get any rods to fire trolling north. Started working our way in about 8:00pm to fish 120-90 FOW, N42’ 41.5’’. Hit fish in all directions with east/west the most productive and marked bait fish in 95 FOW. Three steelhead came on slide 3-set divers set 130’ to 160’ back with a Hitman and a Megatron like spoon. Pick up 3 more larger kings in the 11-14 lb range, two on Killer Dolphin on SWR 63’ down and the other on a purple blue spoon I have had forever 60 ’ down. Had one steelhead crush the Hitman at dusk which was the only fish lost and I lost it. Went 12 for 13 for the trip and everyone had a chance to bring in fish. Great night on the water.